This seminar will be one for the books, so don’t forget to pencil the below details in your calendar and invite a buddy! Join us on Thursday, February 7, 2018 from 10-11 AM at the Health Sciences Library and Informatics Center, room 228 to hear Thomas East, PhD, CEO/CIO for the New Mexico Health Information Collaborative/LCF Research and HSLIC Adjunct Associate Professor, speak on Health Information Interoperability in New Mexico. 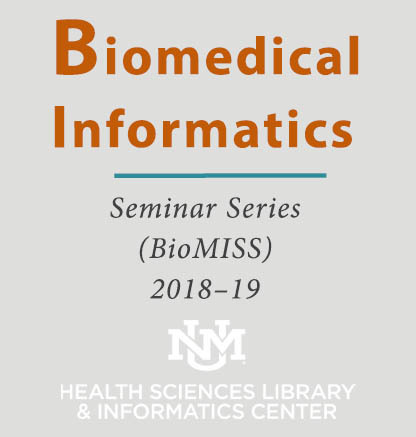 The lecture is free and a part of the library's Biomedical Informatics Seminar Series (BioMISS). To see the full schedule, please visit https://hslic.unm.edu/bmi/docs/BioMISS_Schedule_2018-19.pdf. Questions? Comments? Contact Michael Bernauer at bernauer@salud.unm.edu.